Sanchalana group organised Second Rotary District 3182 Conference for 5-6-7 January 2018, Shimoga, Karnataka under the supervision of DR. R.D Prabhu, PDG, Chairman, programme Committee. Criminal Psychologist Mrs. Anuja Kapur graced the occasion as a Guest Speaker and enlightened the audience of 1500 strength of people on the topic, “women empowerment and society” Mrs Kapur said, “There is the need of an hour to empower men as we empower women too. This will strengthen the bond between the two genders and will provide support system to the society. Creating awareness among women and men equally on gender sensitization strengthen the pillars of love and respect between them. To bridge the gap between the 2 genders these kinds of conferences are required for the betterment and upliftment of the society”. The conference was a huge success and created a benchmark for the future Rotarians to follow in the history of the Rotary Club. 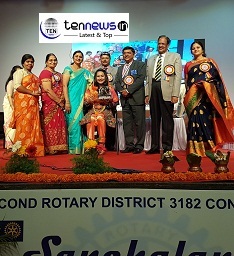 Mrs. Kapur thanked the eminent chair takers of the conference and extended her gratitude towards the hospitality shown by the Honourable Governor of Rotary District 3182 Mr. G.N Prakash and first lady Mrs.Vijaya for the hospitality and support. 2nd Test, Day 4: South Africa (335, 258 all out) set India (307) a target of 287 runs to win. Winners are visiting Pyeong Chang 2018 Olympic Winter Games at Seoul.